As if I wasn’t already in heaven, this appetizer is for angels–angels that like pork belly, that is! This was one of the most satisfying post-ski foods I could imagine. My son and my husband arrived fresh from the slopes about when these arrived at the table and we practically fought over these! My son wanted me us to get another order! The color is a vibrant, ruby red, with a little earthiness. The wine smells flat out delicious–it smells so good that you want to just keep smelling it but it makes you crazy because you also want to drink it! Cherry on the nose with some leather and mushroom. Later I tried it with a mushroom brie which mellowed out the fruitiness in the wine. I could imagine this being lovely with salmon or chicken; I also tried it with an well as a seared Ahi Tuna Salad and that worked well–the silkiness in the fish went well with the silky wine and the fruitiness of the wine also worked well. The wine is surprisingly high in alcohol (over 15%) but remarkably well balanced. Less than 400 cases of this wine were produced. If you can find it, it’s just under $40. I love duck, I love pasta, I love mushrooms, I love rosemary, I love cream sauces. I loved this imaginative dish and I look forward to having it again when I’m not ins such a big rush and I can relax and enjoy it more. The flavors were rich and complex but not overwhelming; the rosemary livened it all up and the wine brings it all out more vibrantly. The second pinot noir was from the Donum Estate in Carneros. More of a cranberry color, it was beautiful and vibrant. Nose had a rich aroma; we could smell the oak–it was almost like a cinnamon stick (in a good way!). While the oak in this wine is more apparent than in the SLH, no worries: it’s not like sucking on a chunk of wood. In fact is a a floral essence to it, like a lavender, and it’s zesty too with a very balanced acidity. Back home I tried it with a wesleyshire with cranberries which brought out the cranberry and other red fruit notes in the wine while a blue cheese brings out the sweetness, in both the wine and the cheese. Only 115 cases of this special wine were made; the wine retails at $75 a bottle. 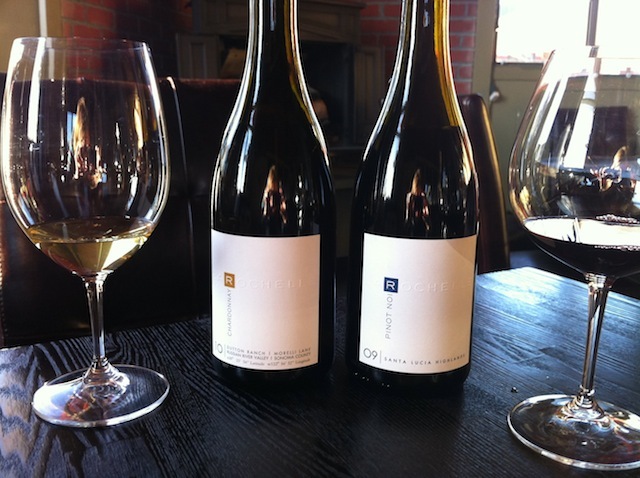 While these two pinots are very different, we agreed they were both new world expressions of pinot noir. Up next: Part 3–Petit Verdot and a cabernet! Followed by Part 4: a return to Rafters and a stay at Sierra Nevada Lodge! Wow, that food looks amazing! And the wines sound pretty special, too. Sounds like a lovely time. Alissa, it was indeed! I wanted to eat it all by myself but it as a mom yourself you can imagine that it was such fun to see the joy it brought to my 9 year old and my husband! And my husband, who often can’t see what all the fuss is about with wine, really appreciated these! Thanks for stopping by and commenting! I’ll go around and see what you’re up to these days too! I always enjoy your writing! Thank you! I have been focusing more on a weekly freelance position but that has come to an end so I will be able to dedicate more time to my own site. Part 2 in this series of posts about Rafters Restaurant in Mammoth Lakes CA: reviews and mouthwatering photos of the foods and reviews of the two Steven Ken Wines LaRochelle Pinot Noirs we tasted there! That pork belly appetizer looks and sounds perfect. Thanks for a great pairing post! Thanks Gloria! If you ever get to Mammoth, Rafters has lots of tasty treats and a very warm, inviting ambiance! Fantastic! I have been wanting to try some LaRochelle and this just might be the impetus I needed to get some!